What is Activity Override and how do I use it? Need to edit the activity data from your device? Read this article on for how-tos, limitations and rules that apply. MoveSpring’s Activity Override feature, when enabled, allows users to easily add data into the platform when they already have a device connected. We wanted to make it a simple process for users who may be manually converting other activities into steps, their device tracks steps but not active minutes, or they simply just left their device at home. Typically, when a user wants to manually input data with a device connected they would need to change their device to manual entry, input their data (up to 5 days), save, and successfully change device back to their tracker. This can take time and isn’t the simplest user experience. The Activity Override feature allows users to edit their data without switching to Manual Entry. If you do not have a device connected to your MoveSpring account, we recommend you use Manual Entry to log your steps. NOTE: Not all admins enable this feature for users. You may not have this available on your account. The Edit Activity button is located at the very top right of your dashboard, across from the "Your Activity" label. Similar to Manual Entry, it allows you to enter in steps, distance, and active minutes for the current day and the previous four days (5 days in total). This is done straight from the dashboard without requiring you to switch to manual entry. Select the 'Edit Activity' button. The next screen will feature a 5 day log of activities. Select the pencil icon for the day you would like to edit. 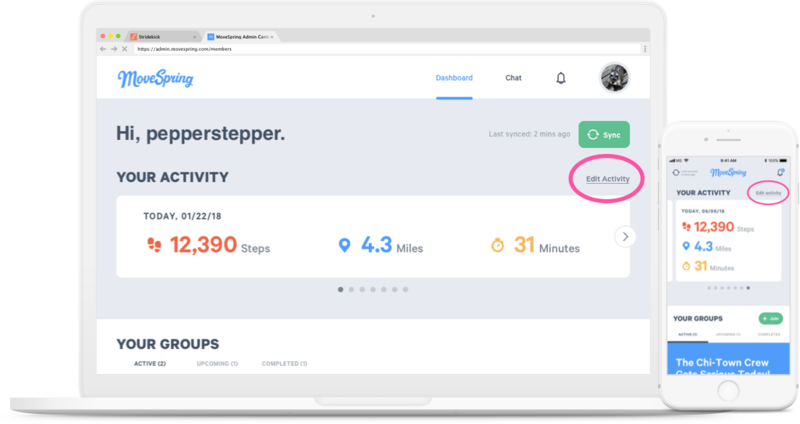 Enter your steps, distance, and/or active minutes data. Only number values are allowed. Please do not enter a comma when editing your steps. Decimals are accepted for entering distance data. Once you're done entering totals, select the green 'Save' button. A green check mark will appear to confirm your edits have been saved. Repeat the steps for other days as needed. Once done, navigate back to the dashboard to exit. To ensure that data is never counted twice, MoveSpring will not combine data from 2 different devices or edited entries. For example: we sync 5,000 steps from your Fitbit in the morning. Then you edit that to 10,000 steps in the afternoon. MoveSpring cannot sync more steps from your Fitbit until Fitbit steps exceed 10,000 steps. To make sure all totals from your device are counted we recommend waiting until the end of the day to make edits, or wait until the next day. Challenge grace period rules will apply to any data that you edit using this feature. You can edit up to 5 days of steps, distance, and/or active minutes, however the challenge will only score the past 3 days. If you are editing the 4th or 5th day back, please reach out to MoveSpring Support to ensure those days are scored in your challenge. Once a challenge group ends it has a default 72-hour period for you to ensure your final steps are counted. After the grace period, the challenge is fully closed and can no longer be rescored. Any activity you edit within the duration of the challenge will save to your MoveSpring account, but can no longer be scored in your challenge. Please note: your challenge admin has the ability to shorten the grace period to close challenge stats early. If you need to backdate activity in your challenge further back than 5 days, please contact your challenge admin(s) for assistance. They can adjust totals, up to 30 days past, at their discretion, or according to their rules. Remember, when using this feature, users are on an honor system. If any dishonesty is suspected, your admin may reach out to verify activity. If you need any help, or have any questions please reach out to MoveSpring Support directly by clicking the blue dot icon at the bottom right (web), or by navigating to Profile and selecting "Need help? Tap here" (app).